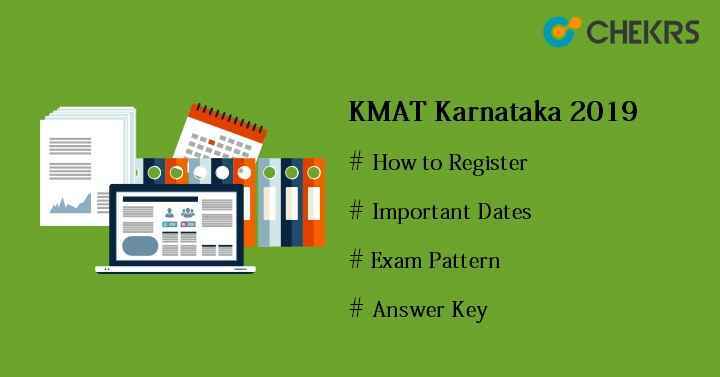 KMAT Karnataka 2019: Karnataka KMAT is commonly known as Karnataka Management Aptitude Test conducted in the Karnataka state for the candidates who will be interested in taking admission into the courses like MBA, MCA and PGDM. This entrance exam will be organized by the Karnataka Private Post Graduate Colleges Association (KPPGCA) every year. KMAT is a state-level management aptitude test held only once a year providing admission to the institutions across the state. After the notification of exam dates is issued, the application form will be commenced on the official site. All interested and eligible candidates can apply for KMAT Online Registration Form. Here we are sharing all the details about Karnataka KMAT 2019. Must obtained at least 50% marks in graduation. Must have Bachelor’s or Master degree with minimum 50% aggregate in marks in any stream. First register yourself with the required details. After registration, go to the application form page, fill other details. Upload scanned images as per prescribed size and format. Pay the application fee and submit the form for final submission. The examination fee can be submitted through online mode only. Candidates must pay the before last date of submission. KMAT Examination Fee will be same for all courses. Rs 800/- will be charged as to fill the registration form. The fee will be non-refundable/ non- adjustable/ non-transferrable. Previous Year Paper will help the students to score good marks in the KMAT entrance exam. Applicants must try to solve the Karnataka KMAT Sample Paper before appearing for the exam. It gives overview about the examination question papers. Practicing more & more KMAT Karnataka Previous Year Paper will improve the speed and efficiency of solving the question papers. Go through the complete syllabus of KMAT exam. Give equal time to each & every topics. Make short point or notes on important topics. Study at least 6 hours regularly. Take short breaks between continuous studies. Make a study plan and follow it strictly. The head controller of examination will publish the KMAT Karnataka Answer Key within 4 or 5 days after conducting the examination successfully. Candidates can match their answers with the answers of released answer key. The answer key will be uploaded on the official site of KMAT. With the help of answer key, applicants can estimate their score in the exam. Students can also claim against the wrong answer and can fill the objection form. After this, final answer key will be released along with the KMAT result. Karnataka KMAT Result will be announced in the month of August through online mode at the official site. Candidates who filled-up the form and appeared in the exam can see their Karnataka KMAT Score Card. Go to the official portal of KMAT 2019. Enter the application no/ registration no & date of birth. Click on “Submit” button. The result will be appeared on the screen. Download it and take the print of it. The official authority will release the KMAT Karnataka Cutoff through the online mode on its website. The cutoff marks will be minimum required percentile to get qualified in the aptitude test. In order to get admission into the colleges/ institutions of Karnataka state, candidates will have to score more than or equal to cutoff marks. KMAT Rank List will be prepared based on the score achieved in the entrance exam by the candidates. Candidates whose name will be included in the prepared rank list, will be called for further procedure that could be either GD or PI round, it will be decided by the respective colleges. Students also have to verify their original documents to able to get Karnataka KMAT Admission in the different courses like MBA, MCA, and PGDM for the academic session 2019.